The DET-KitTM is designed to aid troops in combat operations by providing all the tools necessary for Tactical Site Exploitation (TSE) and Detainee Processing in one case. Ideal for use in areas where persons of interest may be located, the DET-KitTM ensures more efficient and organized investigative operations. A dual-purpose kit. One easy-to-transport package. 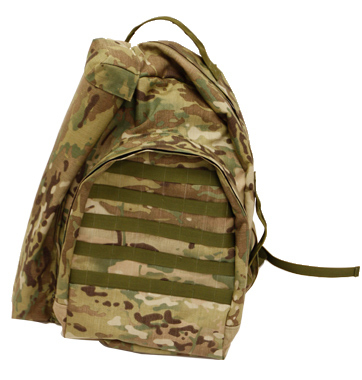 Constructed of a durable, lightweight canvas, the DET-KitTM assault pack is used on combat patrols and vehicle convoys, and can be comfortably worn by dismounted troops. Its contents are labeled in heavy fabric Velcro pouches for easy access and refilling. The DET-KitTM has two distinct sides – one containing items for evidence collection, and the other tools for detainee processing. Available in hard plastic case or assault pack. As with all Defenshield equipment, the DET-KitTM was developed by combat veterans who possess an understanding of the field and the challenges facing today’s security forces. Allows service members to properly detain and secure non-compliant individuals and evidence. Conforms to the rules, regulations and standards of international law for the humanitarian treatment of non-compliant persons and collection of evidence. Fits in the trunk of a vehicle or behind the seat of a tactical vehicle. Used in Village Stability Operations and Joint Operations. Contains extra room to carry small retrieved evidence.